Camping is available on or near the river. 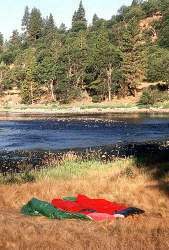 On two or three-day whitewater rafting trips on the Lower Klamath there are several National Forest Campgrounds that enjoy car and river access . If you can shanghai a driver to shuttle all of your gear then there really is no need for gear boats. There are also primitive backcountry campsites along the river. You need to take all gear on the river if you wish to utilize these camps. However there are a couple that have road access. Some of the best sites on the river are not posted along Hwy 96, ask the locals for directions to Cottage Bar and Elliot Creek. Group size is limited to 30 people. Large groups need to make reservations for group campsites in advance. All camps have vault toilets and most have running water. Check out the Klamath National Forest Camping Page for more details about the different camps. Bring your own drinking water. The water is dirty and not suitable for drinking. Commercial rafting companies are required to have 25 gallons of water at each camp. Make sure you bring enough water. Campfires are by permit only. All campfires must be contained in a fire pan or fire blanket. Fire permits are available at the ranger stations free of charge. Visit the Klamath National Forest Page for more information.